1894 was a banner year for San Luis Obispo. The extension of the Southern Pacific Railroad's Coastline route from San Francisco meant San Luis Obispo and other coastal communities finally had an efficient physical link to northern (and to southern California seven years later) that could be accomplished in under 12 hours. The connection created nearly immediate effects on growth, local economies and changed social and cultural expectations as well. The emphasis of this Power-point presentation will be on the construction and operation of the railroad in San Luis Obispo and northern Santa Barbara Counties. Engineering obstacles, operational conditions and historic insights are included as well as an overview of the equipment and the character of operating a railroad in a somewhat difficult territory. 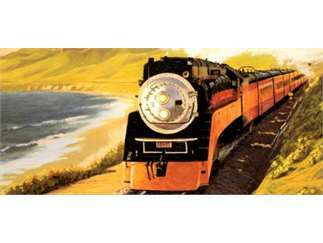 May 4th 2019 marks the 125th anniversary of the Southern Pacific Railroad's arrival into SLO. The presentation is by Andrew Merriam, railroad historian and board member of the San Luis Obispo Railroad Museum. Andrew has been a resident of San Luis Obispo for 60 years. Talk free with general admission to the museum.